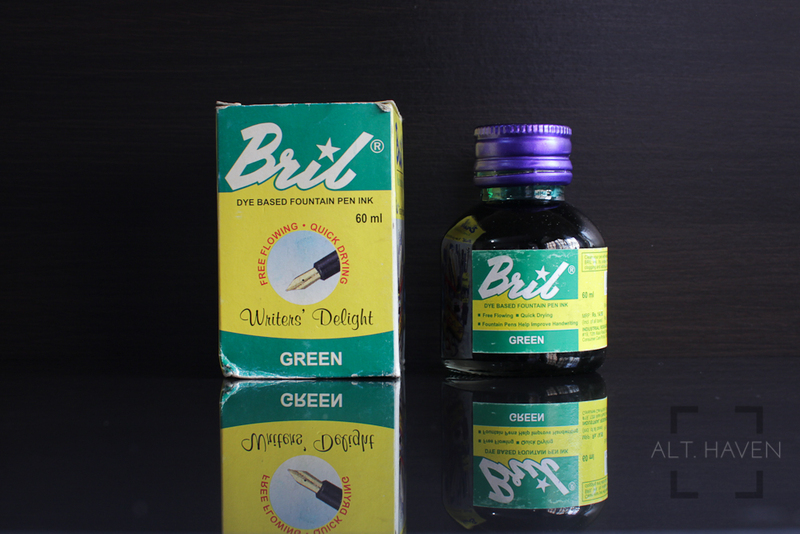 Bril is an Indian company that makes a variety of stationary and among them fountain pen inks. They have a range of 7 inks. 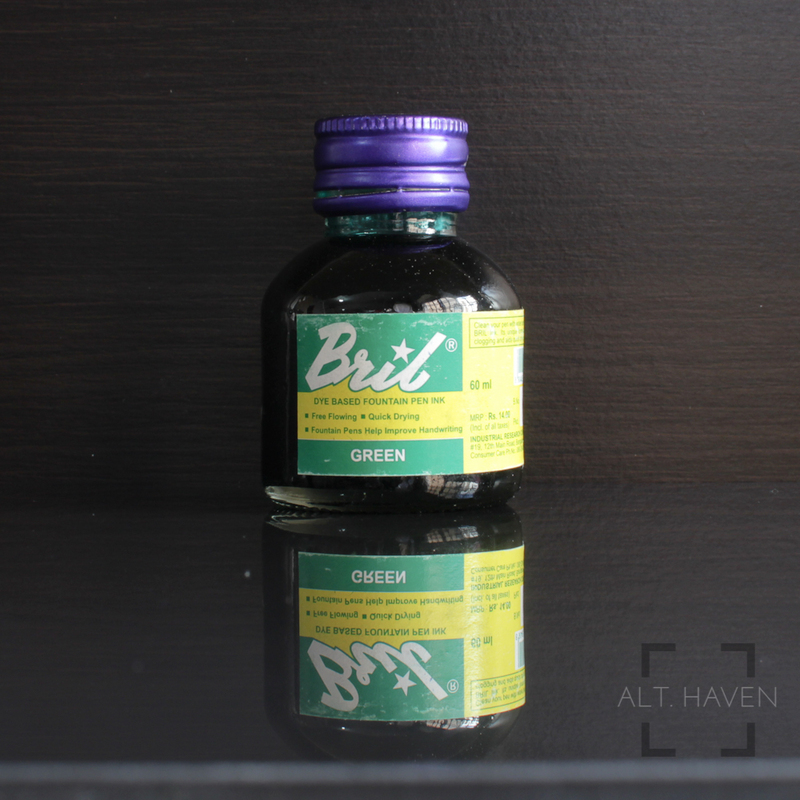 Bril inks tend to be very quick drying and come with a very distinctive smell. Personally, I have been using these inks in my Pilot Metropolitan and TWSBI Mini. Other than the staining with Laurel Rose, I didn't face any issues with clogging. My thanks to Gautam for donating the inks for reviews. These inks will be donated to Olli the Ink Master’s stash so that it can be shared among the members of SFPL. This is a green with a blue undertone to it. It’s bright and stands out on the page. It has a very subtle shading to it. Also it has a distinctive smell to it. Otherwise, it is a serviceable green ink though not quite my preferred shade of green. Bril Royal Blue isn’t the strong blue that I usually associate with inks with that name. 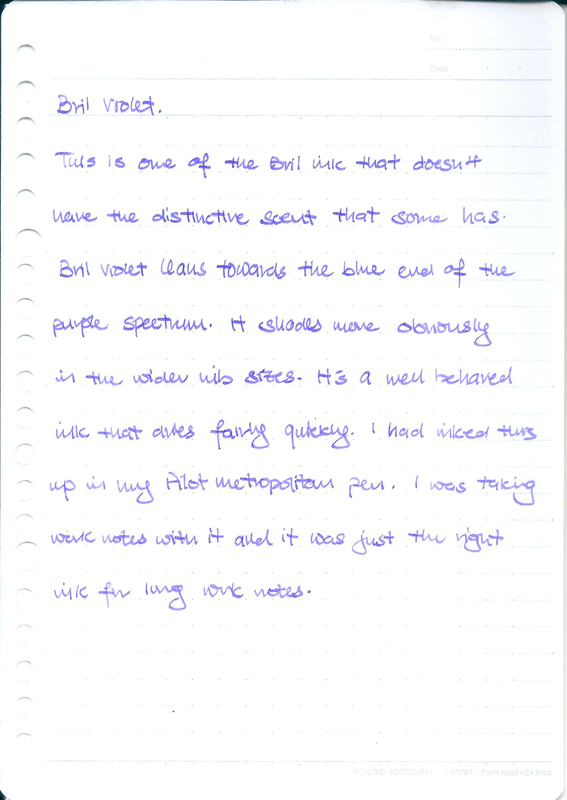 This is a blue ink with a strong purple undertone. It goes down a dark blue-purple colour that dries to a less saturated version. Regardless, it has some shading and an admirable dry time. This too has the distinctive scent. 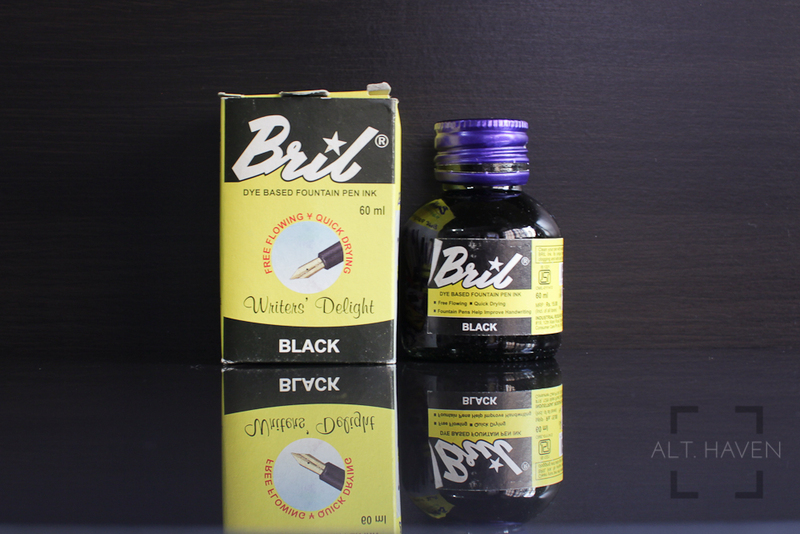 This is one of the Bril ink that doesn’t have the distinctive scent that some has. Bril Violet leans towards the blue end of the purple spectrum. It shades more obviously in the wider nib sizes. 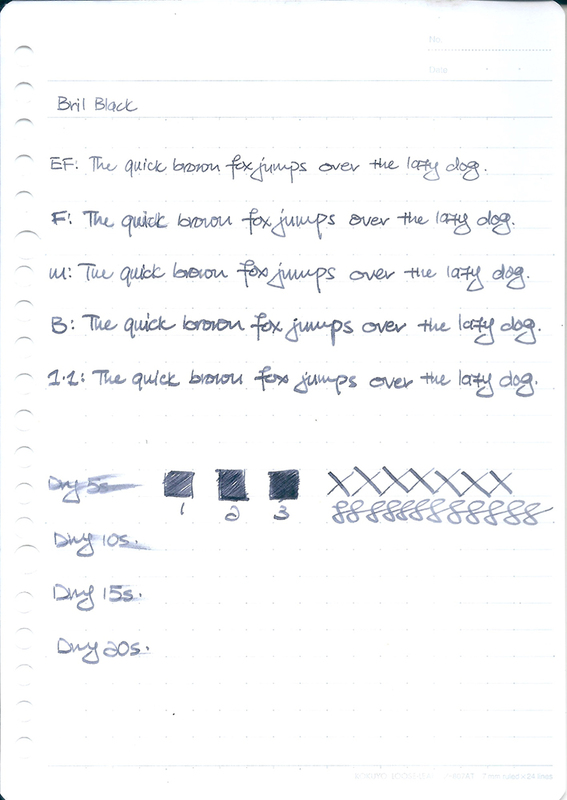 It’s a well behaved ink that dries fairly quickly. I had inked this up in my Pilot Metropolitan pen. I was taking work notes with it and it was just the right ink for long work notes. This red isn’t very much like the red pen that I associate with the teachers’ red pen. It’s more coral red almost pink than red to me. It’s a strange red for the Bril ink series. It’s a different shade from Bril Laurel Rose but the difference isn’t enough to make sense. Bril inks’ range isn’t that vast that people might want to pick and choose between colours that similar. 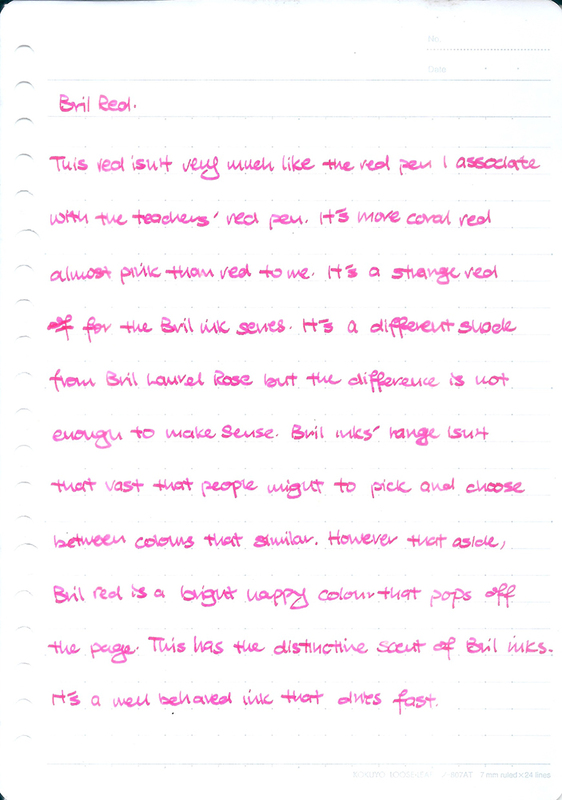 However that aside, Bril Red is a bright, happy colour that pops off the page. It’s also a well behaved ink that dries fast. This has the distinctive scent of Bril inks. I enjoy this ink a lot. The colour reminds me very much of Pilot Iroshizuku Kon Peki but just slightly greener. Bril Turquoise Blue goes down very blue but dries to something closer to turquoise. It shades very subtly. 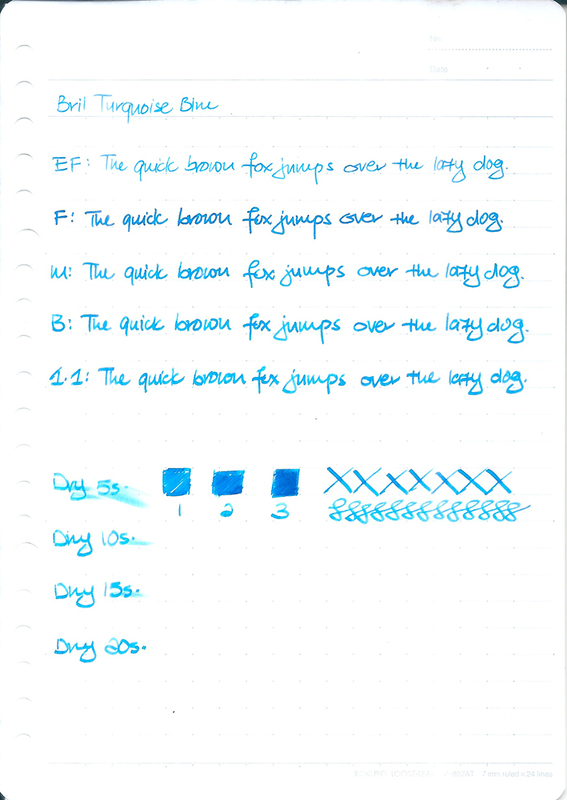 Bril Turquoise Blue didn’t have the quick drying feature of the other inks in the series. This too has the distinctive Bril scent. This bright colour really does cheer me up. This is my favourite ink of the entire series. The black ink of the Bril ink series shades well. 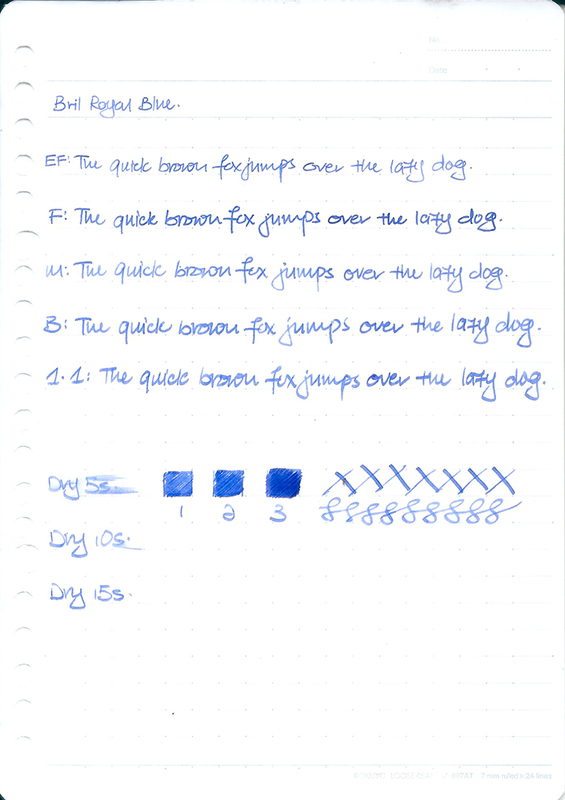 The shading is visible even on EF nibs. However this isn’t a saturated black ink, it is actually more grey than black really. This also has the extended dry time like Bril Turquoise Blue. This is a strong bright pink with subtle shading. It is very prone to staining, actually on second thought, it is highly staining, it turns my TWSBI Mini pink. I wouldn’t recommend you using this ink in a demonstrator fountain pen. I found reviews online showing this ink having a gold sheen at times. This is a great ink. I love the vibrancy of the ink and the excellent dry time though I could do without the staining effects.